The need for faster, more reliable internet service in Rural New Mexico has become greater in recent years. Yucca Telecom is striving to meet those needs in our small communities. 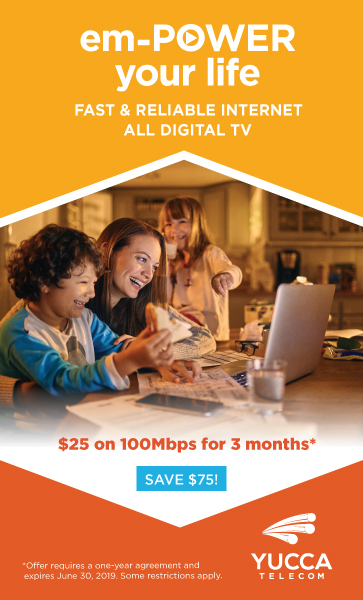 We proudly offer high-speed Internet and digital TV services in Melrose. Jill Tatum, the Melrose Schools Technology Director sees the benefits every day! “More and more content is coming to the classroom as videos. This content streams into the school seamlessly. College credit courses are offered from local universities. A portion of this is video training is also posted by teachers. We don’t have issues with latency or content not loading. It’s made a big difference in what we can offer our students. All State testing is currently – or will soon be – online. Being a small school, without broadband service would make it very difficult for us to provide the testing that is required by the state and federal entities. Since we do have a high speed connection, students can be tested in large numbers. Slower internet speeds would force us to string out the testing for weeks. • 10th grade can take courses through Clovis Community College and Eastern New Mexico University. – New Mexico History, Horticulture, etc. • More courses are available if students choose to take them online. “Melrose High School offers free use of Office 365 software – accessible at school or at home. Students can accomplish tasks – whether it be writing a paper, preparing a PowerPoint presentation etc. – here at school and then easily access the same files at home. It used to be a big problem for some students to transfer files from school to home to be able to work on them. Now they can get what they need from one place. That high speed connection makes it seamless for them to get their work done…wherever they are. Also, if they have a good internet connection at home they can go online and do research faster.